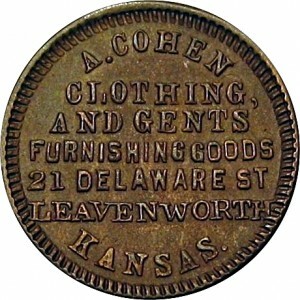 Only a few states produced a single token. They are Alabama, Idaho, Kansas, Maine and New Hampshire. This one for A. Cohen produced two metal types for the same token. At the time, Leavenworth was the way point for those headed west. Leavenworth provided many with the supplies needed to live in that untamed world, especially the Colorado gold miners.